hey, i was deinstalling oracle 11g. it asked me this : “Specify all single instance listeners that are to be de-installed”. i gave database name. but it didn’t work. It says invalid listener list. and another thing i want to tell u is, when i tried to install 11g, i cudnt install due to some errors. it came thrugh few things. so i planned to de-install it and install 10g. i face same problem and when i turn service …._home1TNSListener, everything ok..
May i know what error you are facing? I do not understand what the hell is LISTENER. Please help. 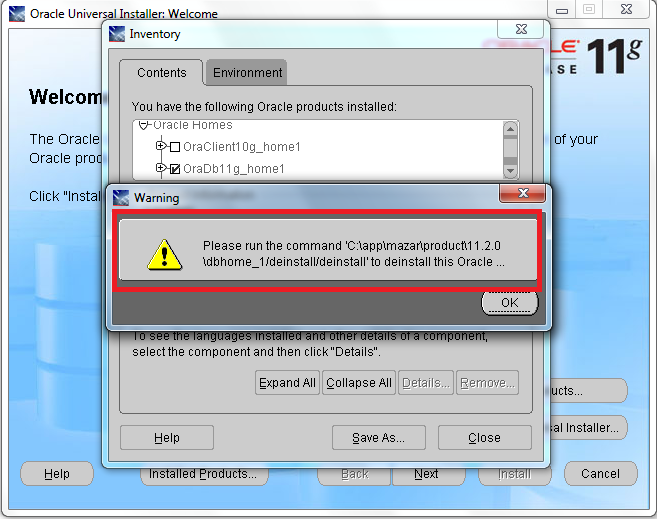 Thnx i was successfully uninstall the oracle 11g r2. thanks for support good work. pls, it is asking me for list of databases. I just install it and nothing has been done on it so i will like to remove it. Thanks a lot! Had to use the separate deinstall tool too.